Now Available on BasharTV*, DVD and Instant Download! 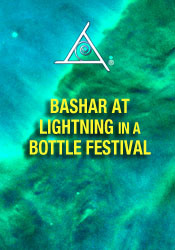 Join Bashar at this exciting outdoor one-of-a-kind event! • Why is there an increase in so many autistic children these days and what can we do about it? • Can we trust that every moment is perfect? • What role does sexuality plays out in your society? • Why are YOU awesome? • How do you perceive the time? • What is the meaning of being? • Does existence precede essence? • Are you an idealist or materialist? • Do we need protection from reptilian ETs? • Could you speak on the Pleadian evolution? • What is the most important thing we can teach our children and the next generation? • How are we going to break free from the shackles of exploitation? • How is climate change affecting us? • What if our highest excitement is to blow up people? • Why are people attracted into dangerous situations like being killed by a bomb? • Do you have anything to tell us about the way we treat animals? • When will you show yourselves physically? • Are there forces working against contact? • We were evolved to eat animals as long as they are raised in their natural habitat? • Why does All That Is chose to manifest itself in negative situations like imprisonment? • Do you have any other tools you can share? • More on permission slips. • What can I do to eliminate negative beliefs I have about support? • Bashar explains the "What would I have to believe" tool for pinpointing a negative belief. • What is your take on vaccinations? What is your take on yoga?